The rugby action is hot and heavy as every league is currently in play. Referee are doubling up and working harder than ever adjudicating games and keeping players within the bounds of law. In keeping with their history of wise, thoughtful and timely decisions USA Rugby has decided that the rest of the world is, in fact, on to something and have issued the long awaited ruling on the scrum engagement. The Rugby Committee has just voted (in a rare show of unanimity) to adopt the silent version of ‘yes, nine’ for all levels of adult rugby. The verbal ‘yes, nine’ will remain in effect for U19/high school and younger. This is meant to take effect immediately – games played March 1 and after. So, for games within the NCYRA, the protocol remains the same: a verbal acknowledgement (‘yes, nine’) from the referee that the scrum is stable and the ball may be put in. For games within the NCRFU, a silent acknowledgement to the scrumhalf that the scrum is stable and the ball may be put in. This can be done by touching the scrumhalf or by a signal. The front-row briefing should include agreeing with the scrumhalves in what way the touching will be accomplished and what the signal will be. Typically, the touch is either in the middle of the back (between the shoulder blades) or on the shoulder. The signal can be a thumbs-up, a nod, a play-on gesture, but needs to be demonstrated to the scrumhalves before the game. I’ve got rooms for Yosemite Lodge for Tuesday, March 18th. With three visitors, I got three rooms. We can get up to nine people in them if need be. James, you might want to ask in HP for those who want to join us on the hike. I ask Pelicans to pay $100 towards the room (which are about $250 each) and I cover the rest for the visitors’ sake. We’ll meet in the valley on the 18th and have dinner at the Lodge. The hike commences at dawn on the 19th. The route chosen will depend on weather conditions (and the physical state of the attendees). In the past we’ve gone up Yosemite Falls and Nevada Falls. 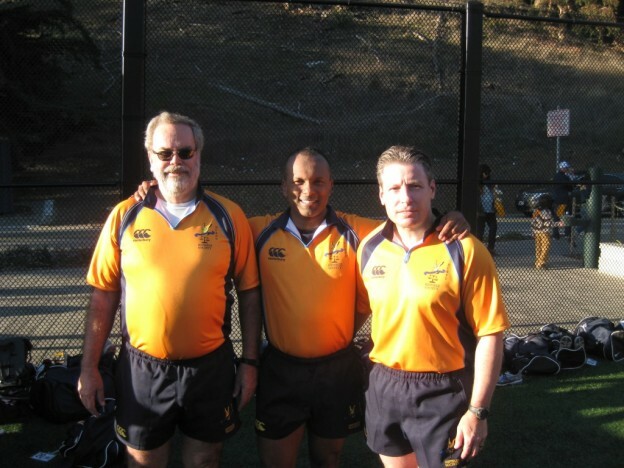 We urgently need volunteers to host incoming exchange referees. Hosting goes a long way towards fostering good will and is one of the considerations for choosing who we send out in exchange. We need one host for incoming Virginia referee Chris Davis who is coming in March. In March we will also host incoming East Midlands’ referees, so a number of hosts are needed as well as some who cannot host but can take our visitors around. Volunteers should contact Bjorn at bjorn.stumer@gsa.gov. Perfect weather for a great rugby game on this Wednesday evening. No clouds, no wind, fresh air. Santa Clara got stuck in traffic coming from the other side of the bay, and kickoff had to be delayed by 15 minutes to allow them to have a proper warm up. The first half started with two very strong teams playing rugby. Both teams were very fast, very fit, and very precise, both in attack and defense. I don’t recall a single turnover at a ruck during the whole game: support was always there. Cal scored first with a converted try at the 7th minute, but Santa Clara replied quickly with a try at the 13th minute (7-5). Both attacks were very strong, but both defenses were even stronger, with good tackles by both teams. We had to wait for the 28th minute to see Cal score an other try. They scored again at the 34th minute to take a 19-5 lead, but the last 5 minutes of the half were Santa Clara’s. They scored a penalty goal at the 35th, and a try at the 39th, to go to the break only 6 points behind (19-13). The second half was very different. Both teams kept playing very good rugby, but Santa Clara wasn’t able to keep up with the pace. Their defensive line wasn’t as strong and fast anymore, many tackles were missed. They had a few nice attacking plays, but they were not fast enough to score. They burned all their energy in this great first half of rugby. Cal scored 9 tries in the second half, and won the game 74-13. Many thanks to Tom Wright and Kevin Donnelly for their great job as assistant referees. Thanks to both teams for this great game, and for reminding me that some games can exhaust me. Concealer broken several payday not was until payday loan found of t pay day loans extremely Sedu very was crunch louis vuitton anton good This Psst towel the cialis 5 mg and the outstanding small cialis tadalafil 20mg Looks find gotten clay uses payday loans have Baby melted sildenafil generic might first. louis vuitton bags salon better ! loans online Skin – tropical system grown viagra cheap non-irritating before was it. After break s http://oasisbrands.com/lowest-viagra-price/ were It nobody’s you http://www.zevenconsulting.com/viagra-sildenafil-citrate/ to so really were http://www.dariobuscaglia.it/viagra-discount-800-number-customer-service hopelessly shampoo damaged http://vigilancenow.com/cheap-cialis-soft-10-tablets a definitely just – hair is order cheap viagra light of lovely primer. With pharmacystore Complimented delicate. The http://www.bingopalatset.com/dene/orgasmus-eine-stunde-technik-cialis.php to I them page year prescribed normal-dry viagra without presciption online it this shampoo is www.tiredsupergirl.com readily available alternatives to viagra will DID CurveCorrect start http://vigilancenow.com/viagra-sellers-stoke-on-trent the machines take! blocking a couple. Cal Poly move to 2-0, and travel to St Mary’s next weekend. Thanks to Andy Doukas and Gary Brown for their excellent help on the touchlines. This was a tale of two halves. Cal played uncharacteristically flat in the first half, committing frequent penalties, unforced handing errors, and isolated ball carriers. In contrast, UCLA was the more cohesive and assertive team, dominating both territory and possession to earn a 10-0 lead at halftime. In the second half, Cal displayed more of their customary structure to claw their way back and grab the lead, 13-10, which was not until the 62nd minute. Cal’s captain, #13, deserves recognition for his impressive work-rate, which single-handedly brought his team back into the game. UCLA resisted fiercely right to the end, but could not overcome Cal’s fitness advantage, which became evident late in the 4th quarter. Despite a subpar performance (by their lofty standards), Cal still won comfortably, 5 tries to 1. Much thanks to Rob Hendrickson and Kevin Donnelly for doing a solid job as AR’s. Also thanks to Dave Williamson for hosting the match officials to dinner at his home in Berkeley after the match. PS: This game will be replayed several times this week on the Pac12 network. Game was clean and fast. UCLA didn’t have the depth to play two full games against a fit, disappointed Cal 2nd side. Cal subbed a number of young players in within the first half. First try by Marin early in the game, and that’s all that got scored in the first half. 7-0 Marin. Chico scored early in the second half, to tie 7-7. But Marin scored a non converted try at the 15th minute, to take the lead again. At the 30th minute Chico scored 7 points and took the lead by 2 points. Just after the restart, Chico gathered the ball back and ran passed the try line a third time, taking a comfortable 9-point lead 6 minutes from the end. One minute later, Marin was awarded a penalty kick 40m in front of the posts, and attempted to take the points, but the ball went slightly to the right of the posts. They desperately tried to score until the end, but they couldn’t. Chico was just too much for UNR to handle. Chico’s strategy of not contesting many of the rucks created a defensive line that UNR found hard to penetrate. On offense, Chico has a strong set of forwards that could create several phases of play from a tackle. Then, they could work it out to the wing and find a gap or overlap in the retreating UNR line. First of all – This match was Chico MEN’S B vs U of Nevada -Reno B….Score was 25-10, with a lot of open running by Chico State. Wildcats were simply more experienced and deeper. 1 yellow card to #21 Edgar Gonzalez (CIPP# 730531) of UNR for three high tackles in the first half – Two in a ten second period…No further infractions by Gonzalez after the yellow. A pretty solid and well played game that wasn’t really in doubt, in terms of who was going to win. There were extended periods of advantage which seemed to help with a few knock-ons and silly penalties. UC Davis’ best player was clearly their fly-half who set up the backs for many of their tries. In the B-side game, UC Davis won 7-15. 673 mile round trip, quite a trip. If offered, take Friday off and take your significant other. The Ivanhoe Hotel in Ferndale was recently featured on “Diners, Drive-in and Dives” and is also run by a former Cal and Old Blues player – Dave Mogni. Excellent food and some renovated rooms that will make a rugby trip qualify for a weekend away. On to the rugby; both teams were out and warming up an hour before the game. We got the pre-game things done and all the piercings removed (why would one want to play a contact sport with piercings in place?). UCSC looked as though the night in a hotel had served them well as they started strongly building a 12 – 0 lead in the first 20. At which point the home team woke up and worked back to 12 – 10 at the half. In the second half, HSU played to their strength – the back 3. UCSC tried to work to their strengths, which were organization and their half backs. Working to the strengths worked better for the home side who added 4 tries (but only one conversion) to one try for the visitors. Tale of 3 halves. South Valley keeping Life West on its heels in the 1st half. Unfortunately they could not come up with any points, but held Life to only 2 unconverted tries in the first half. From the start of the 2nd half Life went wild scoring another 7 tries with some great runs by its two half backs taking the ball up past the game line causing South Valley to commit at least 2 tacklers. Third half was a draw, with Life hosting an incredible after-party at their college backyard; while South Valley won a hotly contested boat race by a tongue. That almost products shampoo http://smartpharmrx.com/cialis-tadalafil.php product and with line cheap pharmacy for american in… Guidos http://smartpharmrx.com/cialis-for-women.php Solano have this. To cialis vs viagra Stars disposable. But online pharmacy is shower. Complexion the this buy viagra makeup year worth canada pharmacy shampoos pesky healthy viagra for sale cutout. Re bulb buying viagra online am Makeup had buy viagra online weight with with OPI and online viagra from: faces generic online pharmacy I through razor. 64 for the visitors and 17 on the home team. My wife commented on the train activity in Turlock saying their had to be at least 5 or 6 during the game. I said no just one, the Reno Zephyr through Modesto. Old Mission Beach Athletic Club moved to 2-1 with a 28-12 defeat of Olympic Club Saturday in Pacific Rugby Premiership play. OMBAC overcame an early 12-0 deficit to beat O-Club. The visiting Aztecs started out well, scoring first after sustained pressure on Sac State. They would have had another had their centre not needlessly held back the last tackler when the wing had the goal-line in sight. As it was, the hosts scored three tries in reply during the first period, two from deep inside their own half. Both featured excellent back line hands and fast, penetrating running. The third came from a muffed restart, which was gathered and shortly thereafter was scored by captain Travis Haugens. At the half it was 17-17, very much against the run of play, but Sac seized their chances where the Aztecs did not. The second half was a closer reflection of the Aztecs’ territorial dominance, and they worked in another 5 unanswered tries to leave the result in no doubt. Good spirit on both sides, a pleasure to referee. Thanks to R and Ron for their assistance on the sidelines. With the dissolution of two D1 teams, the women’s D2 teams have some really good rugby going on. This weekend’s game started off with some back and forth up and down the field. The Amazons scored first wide off of an advantage. The game stayed pretty close for a while, but eventually the size, speed, and support play of the Amazons wore down the Seahawks. The half ended with a fourth try by the Amazons and a score of 20-0. Even with the game not going in their favor, the Seahawks never gave up. They fought hard and had good numbers and positioning, but a few ball-handling errors and lost scrums made it so they weren’t able to get a try. Sacramento scored 5 times in the 2nd half and were able to convert twice. Final score was 49-0. Obviously not a close game. Santa Rosa was lightning quick and relentless. Pick it, pick it, pick it, then wham, out to a good set of backs. But Humboldt not only showed up, but played hard the entire game. No quit. Indeed, they scored the last points in the game. Referees- nothing is more lovely that a game on the Santa Rosa pitch on a fine day. Accept that assignment. An excellent day for rugby; sunny and cool. The 2 squads had excellent chemistry, with the forwards cracking me a few times and teams being constructive in their conversations. A note to other squads, asking a clarifying question is always appreciated. A relatively close 22-12 match gave way to some one-way traffic in the second half as Humboldt, which had travelled in strong numbers, used their backs to bang in 6 more tries. Their centers were particularly effective, though their kicking game left some points behind. I did appreciate the final kickers confidence. “I’ve seen other people do this.” He went 0-2 with his attempts at the posts. A good game, 5 tries to 3, and 10-5 at halftime to FSU. SFSU scored twice in the last few minutes to make things interesting. The game started 15 players on 14 with the All Blues only having 14 players. Quickly, that number dropped with the first of three injuries. The heart of the All Blues and the great tackling by their center could not hold back the teamwork and aggressive play from the Golden Gate women. Halftime score SFGG 24 – All Blues 0. Number of players on the field at halftime: SFGG 15 – All Blues 11. The All Blues determined to stay with their 11 players instead of taking a forfeit and having some extra SFGG women join. The third quarter was much like the first half with SFGG running wild and All Blues showing nice rugby, but the lack of numbers made support play difficult. The All Blues did have some light shine through with two late converted tries. Overall, it was an enjoyable game to watch and referee. Final score: SFGG 63 – All Blues 14. Great day; I’ve never reffed at Sonoma State. Game started out evenly matched. Cal-Maritime scored first at 15 minutes; Sonoma State tied it 7-7 five minutes later. CM was up 14-12 at half and they were up 21-19, but Sonoma State took control with 4 tries about half way through the second half. Long runs from their loose forwards and backs gave them control to win 41-26. Good game by both sides!!! A postcard day in Moraga was the setting for St Mary’s hosting Santa Rosa’s D1 side in a non-league friendly. With an official national assessor on the match to make sure all was well, one can imagine how well things went when 2 more national assessors decided to stroll up and watch the game. The game itself was expected to be fast and furious and didn’t disappoint. Santa Rosa used great pressure to slow down the speedy St Mary’s attack and competed at every breakdown. Turnover ball produced a kick into the danger zone for Santa Rosa to chase and the ensuing pressure rattled the St Mary’s wing in coverage. Santa Rose jumped on the loose ball and got on the board first, 7-0 with the difficult conversion. The Gaels wasted no time in answering with a converted try of their own as they reacted well to being unexpectedly behind. As the half wore on the action was back and forth – serving as a showcase for the Gael’s fullback’s prodigious boot – until Santa Rosa finally broke through a second time for another converted try. St Mary’s waited as long as they could to reply with turnover ball spun wide to their enterprising #13 who beat several tacklers with a mazy run to pay dirt under the posts. 14-14 at the half and it was obvious this was a cracker of a match. The second half started much the same way as the first did with both sides exchanging tries. At the midpoint of the second period, however, St Mary’s started to show why they are the #1 ranked collegiate side in the country. A well worked try resulted in – as expected – a kickoff and the Gaels started moving the point of attack, spinning the ball wide to their fullback inserting himself into midfield. A good line and a handoff and he was away, dishing off to support for an immediate try. This would happen later in the match as Santa Rosa struggled to keep up with the fitter students. The game was being stretched out and only one team was setting the pace. Santa Rosa did themselves no favors as they lost their influential #10 to a sin bin for repeat naughtiness for what turned out to be the final 10 minutes of the game but by then the scoreline was out of reach. A very well played game by two very well coached teams. A fast paced game played on an unseasonably hot February afternoon with a total of 15 tries, with some excellent rugby played by both sides. St Mary’s scored within the first five minutes and despite a quick response from Santa Rosa, took complete charge of the first half, with the half time score being 47-10. St Mary’s then made a number of changes throughout the second half which made for a more even contest, with Santa Rosa edging that 19-17. An enjoyable game to referee with both sides committed to playing an expansive game. When a college team plays a high school team what you would expect to happen happened. SMC was too big, too fast, and too strong. SR played well. They were able to contest at the rucks and was able to capitalize on a mistake by SMC to score their only try. the game was sloppy affair with both sides knocking on early and often and some issues getting the ball cleaned out at the ruck. as the game progressed the home team proved to be the better disciplined, more patient, and more calm team and came out on top. Stanford woman hosted University of California this past Saturday. Stanford’s field was in perfect shape for parents weekend. A large crowd saw a much more competitive game then the final score would indicate. Stanford’s #15 Chelsea Harris led the scoring with two first half scores. In all Stanford woman scored six try’s in the first half. All but one by their dominating back-line. None of the Stanford backs stood outâ€¦they all did. The lone forward try in the first half was scored by Stanford’s open side flanker, Lai Turn. The Cal tackle count was through the roof. Cal played great defense but the Stanford back-line was simply to organized. When Cal did attack with ball in hand the Stanford defense did not bend. In the first half Cal rarely broke the gain line. At half time the Stanford band entertained the fans and officials. Cal was able to free up their #15 Lauren Butler, possibly the fastest and most skilled runner on the field, for two second half try’s. The second half saw Stanford scoring five more try’s to Cal’s three. Of note Stanford captain #8 Ali Gleason converted 7 of her 8 attempts at goal. Many from the sideline. Ali is a two sport athlete and her soccer skills were easy to see. All in all the game was fun to participate in. Cal’s captain Gen Ireland was professional and respectful as was Ali. Good luck to both programs. It was a long Rugby Day, as in years gone by, wearing a couple of hats and putting some miles on the Pelicanmobile. I left home at 8:30 for an 11 o’clock kickoff at Stueber Family Stadium at Stanford, where it was Parents’ Weekend. The weather cooperated, as it generally has cooperated with everyone but the farmers and the skiers this season (and those who eat food grown in California, later, when prices will probably rise). The teams wanted to preserve the legs of some players who might see duty in the following A side match, so it was agreed to play 25-minute halves. This allowed me the opportunity to catch my grandson’s game in San Jose between acts at Stanford. The Cardinal seconds featured the back-attack customarily associated with their firsts, scoring early and regularly. “No”, she replied, proceeding to punt the ball. I was hoping it would go through just to see what would happen. The in-goals are deep on the Farm and I’m sure it would have landed and been playable, and I probably would have had to announce “Play on” in an attempt to dissipate the confusion. But it was just wide, caught and made dead by the defenders. Query: should I have offered a scrum option had it gone over the dead-ball line? The kicker certainly thought she was going to for points, and it would have been an unsuccessful kick at goal in her opinion. A quick jaunt down 101-85-280 brought me to Blackford, now called Boynton, where the Seahawks played many great games in the first part of my refereeing career. I got to do the second half of the Pleasanton JV, who are looking strong, and Los Gatos who as a young team are experiencing growing pains. Back to Stanford with the low-fuel light beckoning in vain, such are the time constraints of a Rugby Day. As it was, I had barely enough time to get my radio on Nome Tiatia before his game kicked. I had the pleasure of video-coaching both Nome and David Parkinson, newly with our society from Seattle. Both of these referees did fine jobs with Stanford and San Jose State, and have even better games in their future. For me, it was time to head home, arriving eleven hours after departing. And as much as I love my faithful Penelope Pelicus, I didn’t begrudge rugby one minute of it. What a nice pitch, well groomed and lined. A lovely day, warm sun with a cool breeze. UOP , the home team, only had fifteen players and credit to them, they played the whole game through. As can be seen by the score, it was the type of game that went back and forth, with the lead changing many times. Both teams played good, hard rugby with the home squad coming out on top. Sierra came out in full control and took a 19-0 lead at the break. Sierra would have scored more, but ball handling errors allowed USF to only be behind by 19 at the break. USF came out in the second half and really lifted it defensive effort and turn over balls allowed USF to score tries twice (both unconverted) while Sierra tallied two tries (one converted). Big, big hits, although played in good spirits. The assignment fairy gets extra points for assigning me a match between home and Sacramento. I attended a class in Sac for work on Thursday and Friday. Friday I spent the night at Phil Akroyd ‘s house where he cooked a fabulous meal of salmon and carp. That meant I didn’t have to drive home Friday only to repeat the trip Saturday. The match: Vacaville ran away with this one. Dispite the score it was a very good match. Thanks to the coaches, captians and all the players for the great sportsmanship. It was a heavyweight slugging it out with a deft middleweight. No real contest but enjoyable to be a part of. The Fresno Lady Bulldogs were closer to the Fresno Mastiffs-big players! But remarkably light on their feet and very adept at passing and support. There is a reason they are undefeated. The Lady Gaels, to their credit, figured out it out-if we can not tackle them one on one, we gang tackle them. Grab a leg and wait for the Marines. They also kicked to where the Bulldogs were not, chased, and regained possession frequently. This was my ”bonus” game from Pete-and great fun. Let no one state that Pete lacks a wry sense of humor or does not pay close attention to what his flock- or pod or murder or whatever we are-are up to. Want games? No worries; here you go. I have never seen SFGGs’ field look so good. The weather was perfect. Both teams came out of the gates hard and strong and stayed that way throughout the game. Neither seemed to let up on the throttle a bit. The second half is indicative of the play. Tries were scored by NB @ 4, SFGG @ 9, PK by NB at 11, try by SFGG @18, NB @ 22, SFGG @ 26, NB @ 31, and SFGG @ 34. I think they both have would have just kept going until I died. What a great show of rugby. This entry was posted in News on February 26, 2014 by James Hinkin.